DAA has started a free clinic to address the basic healthcare needs. 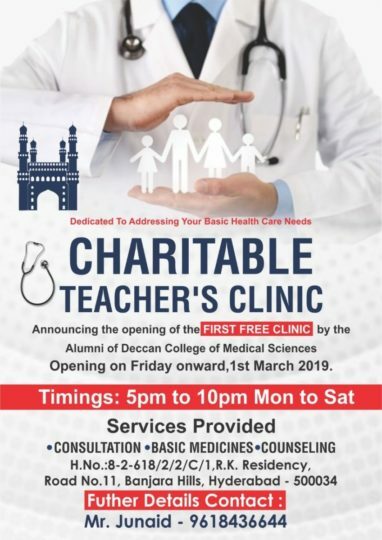 Clinic is operational since 01 March 2019 and works Mon to Sat 5 Pm to 10 PM . It covers Consultations, Pharmacy ,Overseas Alumni Consultations, Lab Services and Surgeries ( Scheduled @ Alumni Hospital’s) Free Camps. The Clinic Is Well Equipped With Tables, Chairs, Computers, A/C, CCTV Camera, Water Dispenser, etc and offers Free Consultation , Free Medicine and Free Counseling.